Trina Solar is one of the lowest cost manufacturers of Solar Panels. This is the reason that the company in a span of few short years has managed to acquire a substantial global marketshare. Trina Solar Panels are one the best quality amongst Chinese Solar Panels. It was the largest company in terms of shipment in 2014. It is amongst the largest manufacturers and suppliers of solar panels globally. Founded in 1997, Trina Solar is one of the world’s foremost PV companies. Fully vertically integrated from the production of ingots to modules into both mono and multicrystalline technologies, Trina Solar offers high quality modules and solar solutions. With more than 12 offices worldwide, Trina Solar has partnerships with leading installers, distributors, utilities and developers in all major PV markets and is listed on the NYSE. Trina Solar Panels can be broadly classified for convenience into monocrystalline and multicrystalline modules. i) Tallmax M Plus – These modules are best used for commercial and utility installations. They maximize output in a limited space. Tallmax M Plus modules have 72 cells, designed for ground mount installations and can withstand upto 2400 Pa wind load, 5400 Pa snow load and even hail stones. These modules are 17.8% efficient with wattage varying between 325-345 W.
ii) Allmax M Plus – These modules are best used for commercial and residential rooftop installations. They come with advanced surface texturing, back surface and solid color dark mono cells to maximize output in a limited space. Allmax M Plus module is a 60 celled module with good aesthetic design suitable for residential properties. They can withstand upto 2400 Pa wind load, 5400 Pa snow load, hail stones and are ammonia ad mist resistant. These modules are 17.7% efficient with wattage varying between 270-290 W.
Trina Solar panels have been installed in the agricultural, education, federal, state and local government sectors. Since solar energy has evolved as an alternative to a competitive source of energy, it is being used widely not only because it is environment-friendly but also because it helps in cutting costs. Trina Solar has installed the biggest commercial rooftop in the world covering an area of 800,000 square meters. Trina Solutions provide Module-integrated monitoring and power optimization. 1) Trinaswitch – is a safety solution in smart module technology that immediately shuts down in case of power outage. It provides monitoring, cloud connection and gateway features. Trinaswitch can be upgradeable to a Trinasmart optimizer. 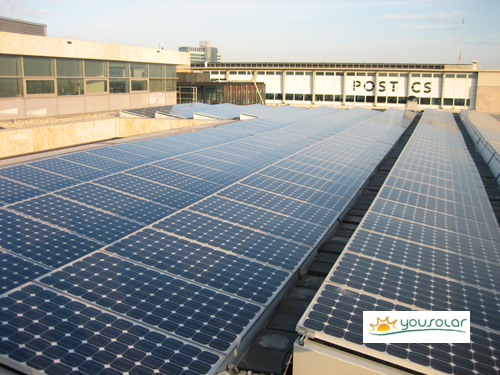 It can be used in all three types of installations – rooftop, commercial and industrial. 2) Trinasmart – can be used for residential and commercial rooftops, and utility purpose. It is designed to deliver maximum solar power at the panel level. Trina Solar has teamed with Tigo Energy to come out with this solution. It gives micro-inverter control and power output at string inverter pricing. It is cost effective, safe and highly productive. It provides panel-level monitoring, so if there is any defect at the panel level, it is immediately detected and taken care of. They come with a 25 year warranty. 3) Trinaflex – can be used for selective deployment of Trinasmart modules in areas where shade and dust hamper the panel performance. It grants flexibility to the customers to use a mix of Trinasmart, Trinaswitch and standard modules on the same string. This solution can again be used for residential, commercial and utility purposes. Thorough article Sneha. I like the Trina TSM-250PA05. It seems to be the best bang for the buck solar panel for systems right now. Trina Solar has proven to be reliable over the years. What is the difference between TSM-PC05 and TSM-PA05? What is your highest performance solar panels. How much Energy% does it give %; 50%? Or higher? I will like to install approx. 25 kw rooftop system. Is there any representative in India or else can I directly purchase from china ? Is there any cost advantage in doing so. Please call to 8274890073 or write us an email at gsoenpower@gmail.com. We will provide you complete information for your concern.